Have you been noticing freezers at your pet’s specialty food store? These freezers are for raw pet food, which is a great addition to your pet’s diet. Raw pet food is healthy, it’s living food, fresh, and it has a high moisture content. Pet owners like the idea of fresh food but are often concerned that feeding fresh raw food will be complicated and will break the budget. Here is what I have found makes commercially prepared raw pet food feeding easy and simple. Complete and balanced , taking the guess work out of making fresh food yourself at home. Readymade, simply take from the freezer. Now, how to keep affordable? Make raw food a portion or your pets diet. So when you give raw you will reduce the amount of dry. Look at feeding your pet in a similar manner you feed yourself. You likely eat some processed foods and some fresh foods, the same can work for feeding your pet. Start by adding five nuggets to your pet’s kibble, reducing the kibble proportionately to compensate for the added raw food. 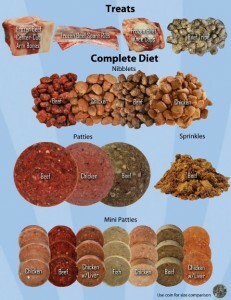 This adds variety to your pet’s diet and makes feeding a raw diet very cost effective. Give it a try, you and your pet will be happy that you did!